But the same old knitting. 2 rounds completed on Thursday, another 2 rounds completed on Friday and there are 6 more rounds to go. 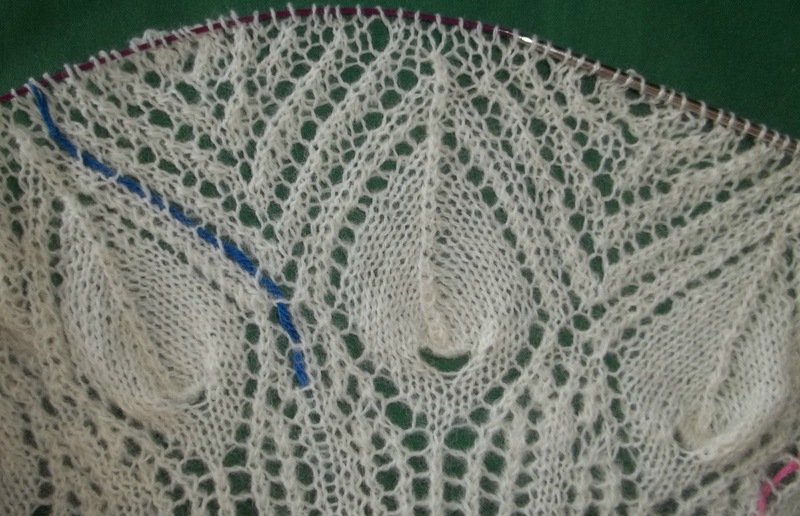 2 charted rounds, with companion plain ones, and 2 final rounds (an edging of a sort) before bind off. See how the second “ribbon of lace” is joined at the top of the feather motif? The joined ribbons now have 5 stitches. These will be decreased to 3, and then to 1 (and in the lace valley's a new ribbon will begin to appear. This second ribbon is final one of the crown of lace that will complete the shawl—though I admit, I am tempted to make more and more-- I really love how they look. 2 things hold me in check—Time:I don't have time to knit any more on this shawl—it's not as if it is finished once I knit the last stitch and bind off! There is still painting and blocking to come). And yarn: -- I'll have enough yarn to finish--(well I think I do!) Though, if I need more, I do have another full 2250 yards of this yarn!--not that I want to use any of the second skein. I am amazed at how much yarn each round takes.. The skein seems to be visible smaller with just the last 4 rounds. I don't really want to ball up the second skein, or to join in a new yarn. 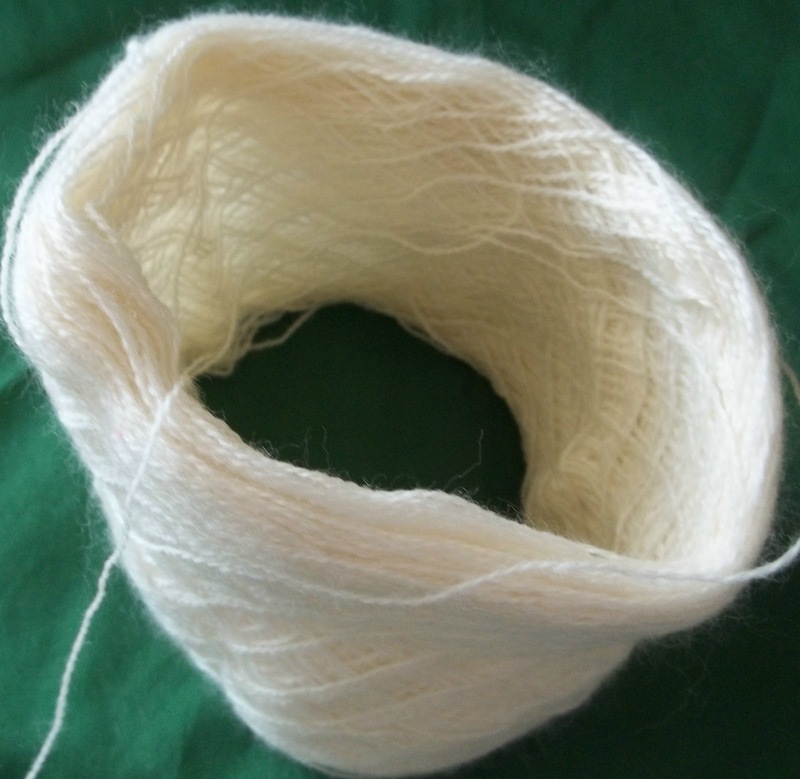 This skein is one length—no knots or joins.. The whole the shawl , a single thread. Amazing when you stop to think about it. 2 more rounds today, 2 more on Sunday and the final 2 on Monday. Unless I get over ambitious—I might. The end is in sight, and its exciting. 2 pairs of socks got some rounds added too. 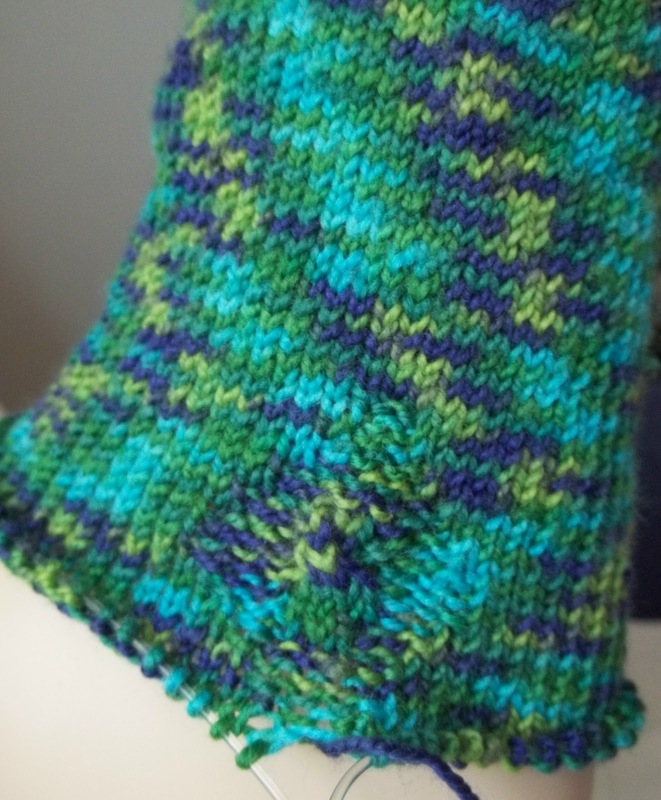 The last dozen rounds of the clock were finished on the Lost and Found socks—It's now time to start the heel flap! The clock design is not very obvious—the all over pattern of the wool obscures the details. I might use this clock design again—Sometime when I use one of the many solid color sock yarns I have in my stash. I like the detail. Clocks on socks are an interesting idea—and generally under utilized. The Striped socks have more stripes—and over 6.5 inches of leg knit. 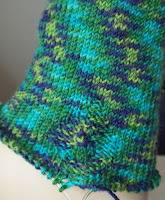 Time to start the little side gussets that I almost always add to afterthought heels socks. I have a high instep, and these simple little gussets add just enough ease to make a difference. These are the last days for the pool, too. The water gets drained Monday (starting at about 5 PM—and the pool is empty by the time we need to clear the deck.) It's a sort of un-official end to summer. Wow. Brilliant. I have been watching this progress for ages - longing to see it completed. Wow and bravo to you. By the way - it's "their" and not "there" on your banner wording, and no comma before the "too" .....seeing as you're talking about language. No offence meant and I hope none taken.